At an age when one otherwise normally plays with model railways with one’s grandchildren, Thomas Kessler is experiencing his second spring. At the tender age of 66 he refers, in ...said the shotgun to the head, to the juvenile culture of rap, but of course without making use of the customary gangsta rapper clichés. His music follows the word cascades of the slam-poet Saul Williams in great detail. It is strengthened by a rap choir that is to be cast for each individual performance, made up of schoolchildren in Cologne: seven voices sitting in the orchestra and – in the closest contact with the classical musicians – propelling the event. 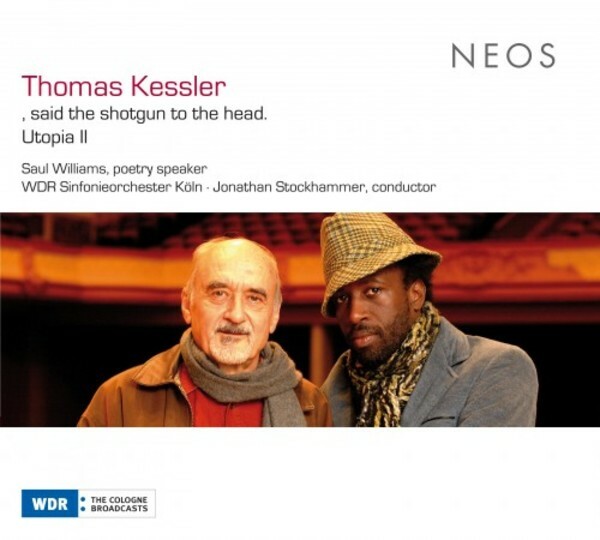 Kessler goes still further eight years later in Utopia II. His idea of live electronics is central here, reflecting decades of studio experience. Each musician has a microphone, loudspeaker and laptop at his disposal alongside his instrument, and can individually control and alter the sound. The whole, therefore, is not regulated by a “god at the control desk” but by musicians who listen attentively to each other. The result is a multi-layered, hardly foreseeable orchestral sound containing, alongside instrumental tones, countless sounds, remote voices and noises, as well as fragments of news channels.